Each year, The Royal Mint marks important British anniversaries, events or accomplishments on our coins and today we are pleased to reveal UK’s new coin designs for 2017. This 50p coin has been issued to mark the outstanding achievements of Sir Isaac Newton and has been designed by Aaron West. 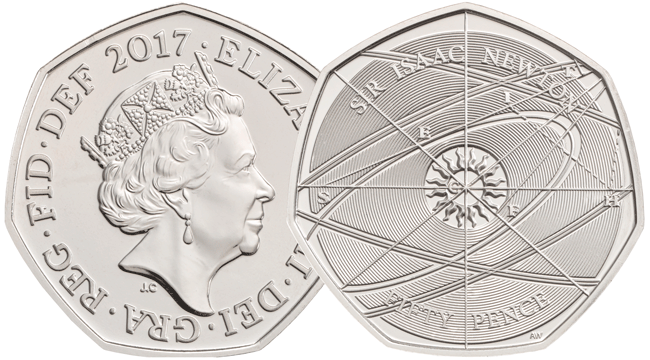 The 50p coin commemorates the revolutionary scientific and mathematical genius, Sir Isaac Newton and his remarkable legacy. He discovered the laws of gravity and motion and remains one of the most famous men in history. This coin really needs to be seen in real life as the concentric design cleverly catches the light differently from every angle. 2017 sees the 200th anniversary of Jane Austen’s death – and this £2 has been specially designed to commemorate one of the most famous authors of all time. Featuring an unusual ‘cameo’ design and Austen’s signature, this coin is sure to be highly sought-after. The latest in The Royal Mint’s series of two pound coins commemorating World War I, this particular issue pays tribute to the role of the air force in the conflict. Designed by tangerine the striking aerial perspective is a first for a UK £2 coin. 100 years of Royal tradition are honoured with this exceptional £5 coin – commemorating the Centenary of the House of Windsor. In 1917 King George V changed the name of the British Royal Family from Saxe-Coburg and Gotha to the now familiar Windsor. The coin’s pleasingly traditional design features Windsor Castle. Some of these designs are really exceptional, and they are certain to become more sought-after in years to come. Which is your favourite? Let us know in the comments!